I wouldn’t have missed her if she had taken the plunge, but she didn’t stop me from wanting to read on to see what happens to the hapless group. Spoiler alert—they do no jump. I’m not giving too much away, as I’m not sure how the book would continue with all the characters dead within the first few pages. Instead, they form sort of an unlikely support group. They occasionally meet to reassess if they should continue with the original plan or move forward. 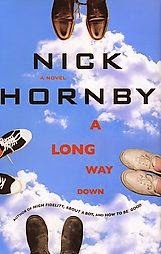 Although the premise of the book is definitely a downer, I found the book quirky and quite entertaining. It’s worth a peek. The movie is due for a limited release in the U.S. on 7/11/14. It was already released in the U.K. in March, 2014. It has a star-studded cast with Pierce Brosnan playing Martin Sharp, Toni Collette as Maureen, and Rosamund Pike as Penny (Martin’s co-anchor). Rosamund is also cast in Gone Girl as Amy –due for an October release. Update 11/5/14. I just watched the movie on DVD as it never came to our theaters. I liked it and even tolerated Jess, who somehow seemed a little more likable in the movie, even though she was still obnoxious.